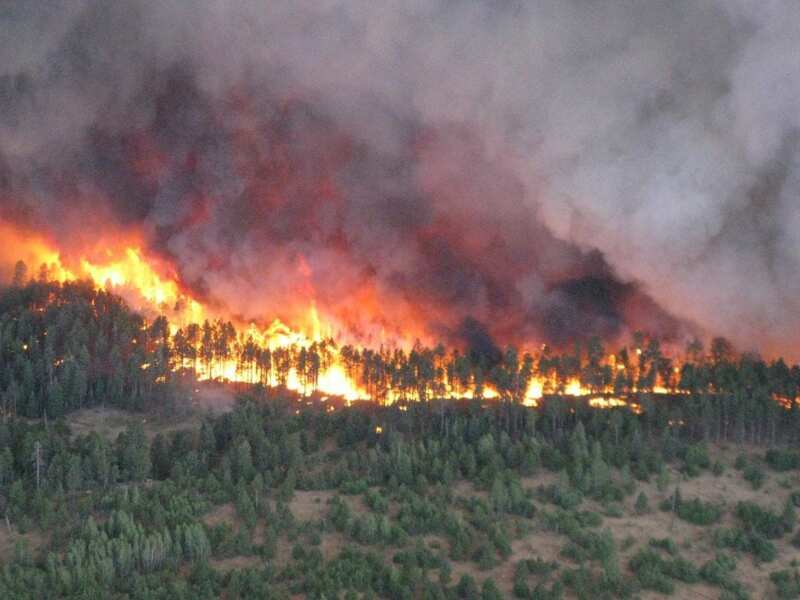 The 2011 Las Conchas mega-fire in New Mexico burned more than 150,000 acres and threatened the Los Alamos National Laboratory. Now, using data from the fire, researchers at Los Alamos have created an experimental model that will help us better understand the interactions of fire and water in the soil. Adam Atchley, a researcher at Los Alamos National Laboratory, and his team set off with a goal: to evaluate how the soil’s water balance changes before and after a fire, depending on the burn severity. They designed an experimental model to simulate the effects of wildfire on the water balance of a burned site. The model used actual site condition measurements in the Las Conchas fire region. These measurements were taken several years before the fire by the Bandelier Fire Ecology Field Team. The model also incorporated burn severity data from the wildfire. They found low- to moderate-severity wildfires result in wetter soil. Water leaves soil in multiple ways. Water can move through plants, escaping as vapor through pores in the leaves. This is called evapotranspiration. When vegetation is burned, evapotranspiration is typically reduced until plants regrow. As a result, less water is pulled out of the soil. It remains wetter. Surface runoff is another mode of water movement. Wildfire can make the soil more vulnerable to this moisture loss. Fire removes the absorbent layers of fallen and decaying plant matter on the forest floor. These layers, called litter and duff, can store more moisture than soil can. Without these layers, heavy rain can provide more water than the ground can absorb. This contributes to surface runoff. “It is well known that fire disturbances can have a strong effect on how water interacts with land,” said Atchley. “Fire often dramatically increases flashy runoff responses to storms following the fire disturbance. But it also reduces evapotranspiration. What is not well understood, and is hard to measure, is how these two competing processes change the site water balance, or how wet or dry a burn site will be after the fire. Increasing the runoff would make the site dryer overall while decreasing the evapotranspiration will keep water on the site and make it wetter,” Atchley said. The experimental model identified an important tipping point. In high-severity burn sites, increased runoff outweighs the effect of reduced evapotranspiration. Water runoff is greater than the water retained, leaving comparatively drier soils after the fire. The soil and vegetation conditions that affect moisture after a wildfire will also change over time. For initial site recovery and water management planning after a wildfire, these findings have important implications. Read more about this research, with collaborators from San Diego State University, Bandelier National Monument, and California State University, Los Angeles in Vadose Zone Journal. The work was funded by Los Alamos National Laboratories Laboratory Directed Research and Development (LDRD). For more about forest soils and fire, read this blog.